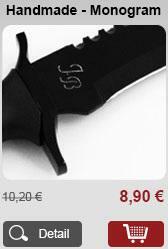 is a specialised e-shop with knives and knives accessories. We offer hunting knives, throwing knives, ceramic knives, folder knives and many others. You will not find anything else than knives in our assortment because we want to do just one thing for 100%. We do not want to mix knives with for example flashlights, crossbows, bows or watches, simply said with products that have nothing to do with cutlery. We want to devote ourselves only to what we are good at. 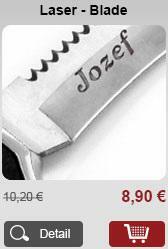 We offer you knives from many producers from all around the world, for instance USA, Germany, Japan, Russia. Our knives are divided into a well arranged categories which will enable you to orientate yourself well in our shop. Our goal is not only to provide our clients with products of the highest quality, but also with a professional approach. Our staff is willing to answer your questions regarding knives, their utilisation, availability or any uncertainities anytime. We would like to offer you a simple and safe on-line shopping. Do not hesitate to contact us with possible questions, comments, we will gladly answer them. 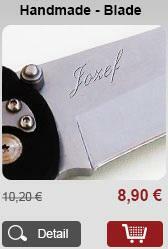 You can send us an e-mail to info@euro-knife.com. We believe that you will be absolutely satisfied with our services! We wish you pleasant shopping.